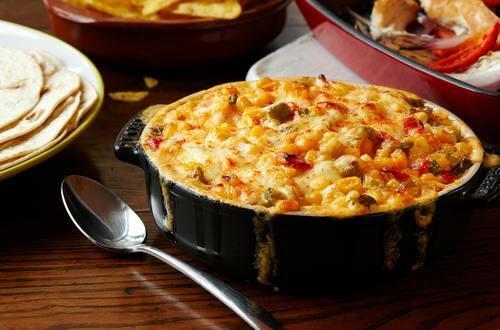 This warm Mexican-style corn dip featuring creamy Hellmann's® or Best Foods® Real Mayonnaise, sour cream, cheddar, jalapeño and paprika adds a kick to any party. 2 Combine all ingredients in medium bowl. Spoon into 1-quart baking dish. 3 Bake* 20 minutes or until warm and bubbling. Serve with chips or your favorite dippers.